Whether you're looking to rent or buy, MOVEHUT has a huge range of commercial properties available in London. It might be a shop or retail store in the centre of London that you're searching for. You might just want just a small property in London that will be perfect for your business. So let MOVEHUT help make your property search in London easier than you could ever have imagined. 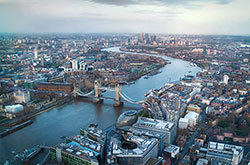 London is the capital city the UK and one of the world's leading financial centres. It is also regarded as a major cultural centre. London has a diverse population and is an international tourist destination attracting more visitors than any other city. London is also an attractive location for foreign investors and, consequently, has some of the highest commercial property prices in the world. No matter how confident you are about buying a commercial property, it's always good to have a little advice, which is why MOVEHUT have included some useful tips. Primarily, you must keep in mind the hidden costs of buying and running a commercial property, and to budget accordingly. We believe that one of the best pieces of advice is to always consider the location of your property in London, as this is something you can't change easily at a later stage. Keeping some of our key tips in mind is really going to help you find a suitable commercial property in London, with MOVEHUT. There are a winning selection of property categories available to rent or buy in London. Whatever type of commercial property you are looking for, from offices to shops, we have them here at MOVEHUT. In addition, you may be looking to buy a plot of land to build a commercial property to your specifications. When it comes to commercial property types in London, MOVEHUT has plenty of choice in every category. Want to buy a commercial property in London? Commercial properties for sale in London can be found in our extensive property listings. We have many options to narrow down your search, making it easy to find the property you need. All our properties in London can be narrowed down using property size and price filtering functions. Why wait, get started with your property search today in London. London's history can be partially traced through surviving records relating to its buildings which start to become common around 1500. Initially they refer to churches and dwellings but as London becomes increasingly important as a centre of trade the records reflect this. From this point onwards they begin to include details of rental agreements relating to commercial property, providing a picture of a growing mercantile culture. During the nineteenth century London was the world's largest and richest city. It was the centre of Empire and international trade. Increasingly Victorian Britain (and London in particular) began to see itself as the heir to the great civilizations of ancient Rome and Greece. This was reflected in the construction of grand civic buildings and industrial commercial properties resembling Venetian palaces. Some of the city's famous retail commercial properties also emerged during this period. During the early to mid- twentieth century London continued to prosper but World War 2 would mark the beginning of the end of its position at the heart of empire. And the city itself suffered enormous damage. During the Blitz over 30,000 Londoners were killed as a result of air raids and thousands of residential and commercial properties were destroyed. Following the war, reconstruction saw new office developments changing the skyline and by the 1960s the phenomenon of Swinging London put the city – including the commercial properties of Carnaby Street - at the heart of burgeoning pop culture. By the mid to late 1980s London had reinvented itself as a major international financial centre and the derelict Docklands were transformed by a large scale commercial property development. London marked the beginning of the 21st century with the opening of the iconic Millennium Dome building (now the O2 Arena commercial property). Its status as a leading financial centre continues and London remains a top location for sport and entertainment. The estimated population of London is approaching 8 million. The city has a diverse population both ethnically and by religion. While those who describe their ethnic background as white (British, Irish or other) make up close to 70% of the population there is a significant minority of Black (British, African and Caribbean) and Asian citizens. In terms of religion those describing themselves as Christians make up close to 60% of the population. However due to London's diversity most world religions are practiced in the city. London's economy is today based on the service industries which employ approximately 85% of the working population. Over 300,000 people are employed in the financial sector alone, making finance London's pre-eminent industry. Other industries with a strong presence in the capital include the media, fashion and art and design. Commercial property in London, particularly office space in the City of London, is among the most expensive and sought after in the world. Over 100 of Europe's largest companies have their headquarters in London. In fact, according to recent reports, over half of City of London office space is now under foreign ownership reflecting London's global status. London is one of the world's leading centres of education. London has a larger student population than any other city in the UK. The University of London is the UK's largest higher education institution comprising around 20 colleges. These include University College London, Birbeck College and the London School of Economics to name but a few. In addition there are other universities in London not aligned to this body. London is also a major provider of arts education with institutions including Goldsmiths, Slade School of Art and St Martin's College. There are 33 Local Education Authorities (LEA's) in Greater London. Public schools in London include Harrow, Westminster and Highgate School. London is the seat of the UK government based in Westminster. 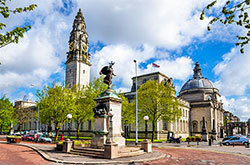 Local government is split into two parts, a section of smaller authorities responsible for localised administration and the city wide Greater London Authority. The powers of this body are split between the Mayor of London and the London Assembly which has the power to veto mayoral policy. The area of Greater London covers 610 square miles. The city's location on the Thames has been crucial to its fortunes but it also places London in danger of flooding. To combat the threat to life and reduce the potential of damage to domestic and commercial property the Thames Barrier was constructed in the 1970s. The current 32 London Boroughs were established in the 1960s. The City of London is an autonomous body and is not included in this structure. London has a temperate climate with an average high of 15.2 c (59.4f) and an average low of 7.4c (46.3f). London's combined internal transport is governed by Transport for London (TfL) which administers London busses, the underground and over ground trains. London is also the UK's principle national and international transport hub. London Underground is central to local travel. Opened in 1863, it is the world's oldest metro system. Today it carries approximately 3 million passengers every day. Also providing local public transport are busses, rail (including the Docklands Light Railway) and a tram system introduced in 2000 serving outlying areas. Drivers should be aware that central London is subject to a congestion charge. London is served my motorways and major roads leading to all points of the country. The city also has 10 intercity rail stations and National Express operates an extensive service from Victoria bus station. London has 6 airports carrying 150 million domestic and international passengers each year. In addition Eurostar operates a regular service to the continent from St Pancras Station. London is a major sporting centre regularly hosting national and international events. These include football matches at Wembley Stadium and Test cricket at Lords and the Oval. London also offers Rugby Union at Twickenham and hosts the annual Wimbledon Tennis tournament. Beginning in 2005 when London was awarded the 2012 Olympic Games there has been extensive regeneration around Hackney and other areas close to the Olympic Park with many commercial properties being built alongside sporting venues. London is the UK's capital of culture with an international reputation. It is also a destination for shopping, entertainment and leisure. 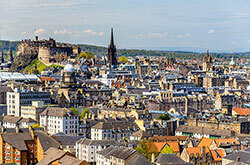 Tourist attractions include Buckingham Palace, the Tower of London and London Zoo. London is one Europe's prime shopping locations with hundreds of renowned retail commercial properties in world famous shopping districts. These include Oxford Street, Covent Garden, Soho and Regent Street. London offers entertainment to suit every taste with world-class restaurants, clubs and bars across the city. London is the home of the BBC and other broadcasting companies. Most national newspapers are also based in the city. The London Film Festival presented every October by the British Film Institute (BFI) is one of the world's foremost film events featuring the best of contemporary and international cinema. London has a rich musical history and caters for every taste from classical to jazz in venues ranging from huge arenas to intimate clubs. Every summer the Royal Albert Hall hosts the world famous orchestral event The Proms. London's West End is one of the leading international theatre districts boasting venues such as the Palladium and the Lyceum. Attending one of the many popular musicals or other theatre productions is considered to be one of the highlights of a visit to the capital. London is home to many of the world's leading museums and art galleries. The British Museum has a collection spanning the history of human culture. Among its highlights is the largest Egyptian collection to be found anywhere in the world. Other museums of note include the V&A Museum and the Natural History Museum. London also has a number of internationally famous art galleries. These include the National Gallery which houses an outstanding historical collection and Tate Modern which is home to one of the foremost collections of modern and contemporary art.